A new way to cook pasta? We have to protect our bees. Busy mum of 3 Have a look at the clever way she is filling the kids' pool. Greenhaven Hello Linda! I met Linda when I was doing my book tour. Flowerlady - there is some beautiful embroidery here. I've been looking forward to this time of year, when I look at my calendar and there is nothing booked for weeks. No appointments, no reminders - nothing but the freedom to choose whatever I want to do. It's a good feeling after this very busy year. Mind you, I'm in the middle of a writing project so that will take up a lot of my time but it's nothing close to the pressure of the months just passed. I'm looking forward to a quiet and productive weekend. I hope you have the same or complete relaxation. Thank you for your visits here this week. I'll see you again on Monday. 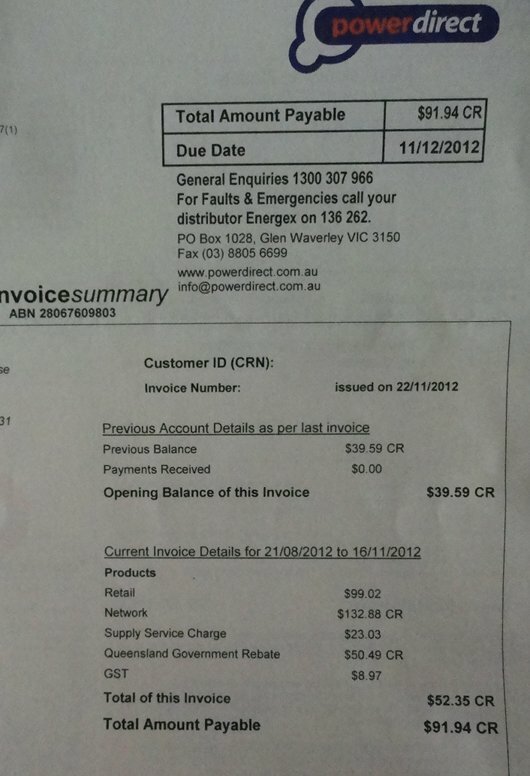 Our electricity bill came last week. It's something that many of us fear now because, in Australia, and possibly in many other parts of the world, electricity prices are skyrocketing. It was good news for us though, we're in credit and have been since our solar panels were installed 18 months ago. But I know how tough it can be when you're faced with a bill that you know you'll struggle to pay. I thought it would be worthwhile to consolidate our ideas on reducing electricity consumption. One thing is for sure, the rate we pay for the electricity we use is not going down any time soon. Let's be proactive and work to reduce the amount of energy we use in our homes. This is really small steps stuff - there are no big savers, unless you install solar panels or go off the grid. You will save electricity by doing a lot of small saving steps. I'm not going to recommend a whole list of things that might work. What I'm suggesting is what we do here and what I know works. 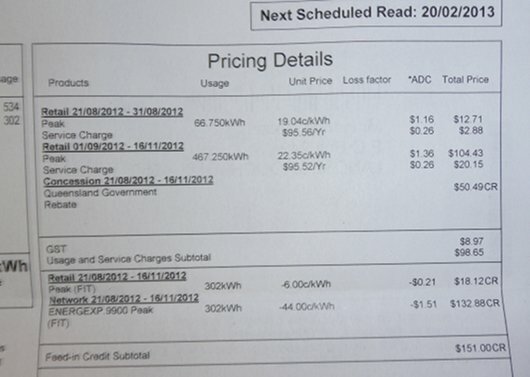 The power bill we received last week showed a very interesting statistic. 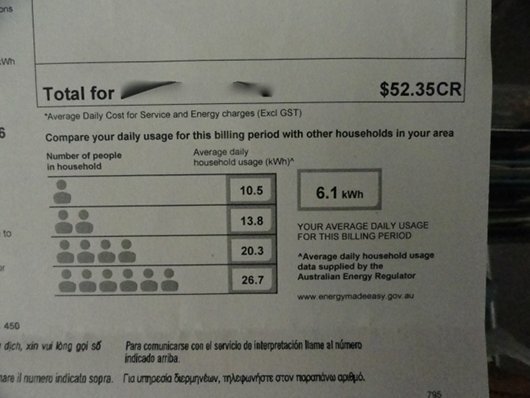 See below, our average daily usage in this billing period is 6.1 kWh (kilowatt hours). That is less than half the average for a two person household and 4 kWh less than a one person household. That is nothing to do with solar panels - it is simply us not using the amount of electricity that most people use. Let me qualify this a bit so you get a full and clear picture. We get the government pension rebate of $50 per bill. We have solar hot water and solar panels. We've had solar hot water for about 30 years but it was only when we had our panels installed 18 months ago that we ever had a credit on our bill. We have the smallest solar panel unit you can buy. It's 1.6 kVa (Kilo Volt Amperes). We saved up to have that unit installed, we got a rebate from the government that helped with the purchase and got in on the deal to sell our excess electricity to the grid at 44 cents, we buy it at 19 cents. With that smallest unit and the small steps we take every day, we have not paid for electricity for 18 months, even though the rates have risen so much. But let me say again, all that has nothing to do with the amount of electricity we use. We use less than most people, not because of the solar panels, but because of the four steps we take. I'm not going to say you'll be in the same position we're in. We don't have to monitor any one else's usage, our kids have left home and it's just us two. I know how difficult it is with others in the home, especially when they're teenagers. Just a little tip if you do have teens or young adults still living at home. Our sons only became more frugal with the electricity usage and more mindful of turning things off, when we made them pay the electricity bill. It wasn't much back then, and they were working, but that sharpened them up quick smart. We tried to reason with them about energy conservation until the cows came home but nothing worked like paying the bill themselves. 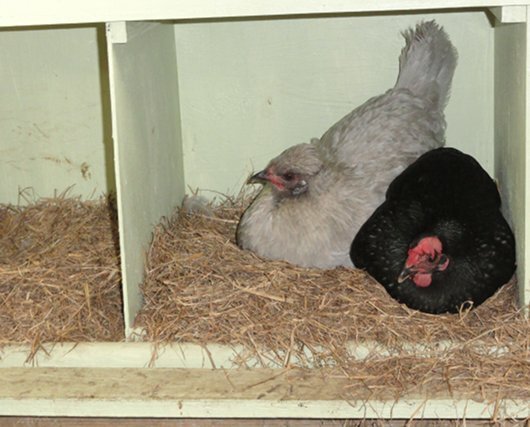 We do have a lot of visitors now, we have four extra people staying with us at the moment. We often have our kids and their families, or my sister here. So these figures are not really just for Hanno and I. It's us, plus. This is important: Find out about your peak and off-peak times for electricity usage. You need to understand this because it could be your biggest saver. Either go to your electricity supplier's website or phone them. Most of the time you use electricity will be during peak times. You need to know when peak time starts and stops, when off-peak starts and stops, and how much you pay for your electricity during those two times. Off-peak will be cheaper but it will also be at night when most people aren't using electricity - that is why it's cheaper. So what do we do? There are our four main things. If you use appliances with high energy needs - washing machine, dishwasher, dryer, vacuum etc, do that work at night during your off-peak time, or if you have solar panels, when it's dark. Often it's just a matter of turning on the machine, letting it do its thing, and finishing off in the morning. It takes a bit of reorganisation, but it's worth it. Using high energy appliances during your off-peak time works if you're using grid electricity because you'll pay less for the electricity you use then. If you've got solar panels and you sell your excess to the grid use your high energy consumption appliances when it's dark and your panels aren't generating any power. When we have to buy energy, we pay 19 cents for it, we sell it for 44 cents. It's better for us to sell the power we generate during the day for 44 cents and to use it at night when we pay 19 cents for it. If you sell your excess to the grid and have a similar deal, that will work for you too. We are not wealthy people but slowly over the years, we replaced every ordinary light bulb with energy-saving compact fluros. 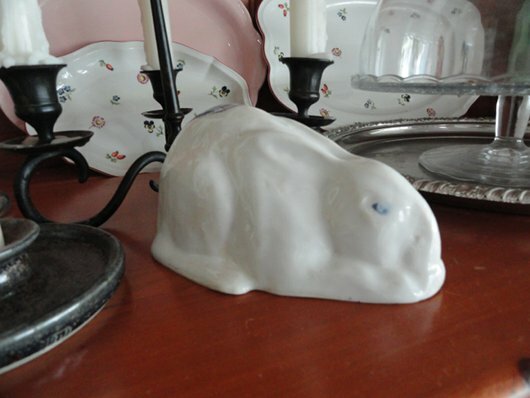 We buy them when we see them on sale and have a small stash for replacements. We do our research when we have to replace appliances and white goods and we always buy the energy efficient model of whatever we need. Even if it's more expensive, it's worth it. You'll probably pay for the difference in price in two or three energy bills. Turn off lights and appliances when you're not using them. Having appliances on stand by, even when they're turned off, still uses electricity. Turn off at the wall. And that's it. Four tried and tested steps that work for us. What are you doing to save on your power bills? Why electricity bill are rising. 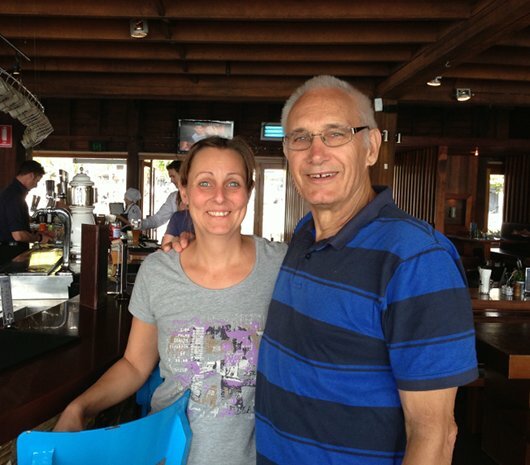 Hanno and I had a lovely day out last Thursday, visiting friends just north of here. Our good friends Beverly and Michael have just moved into a beautiful home on 400 acres on the Mary River. Michael took us down to the river where we stood in the shade and watched fish swim around in the river. They plan to develop the property as a multifaceted centre for indigenous groups, local and international tourists and for growing vegetable crops for sale. They have a couple of horses, chickens and, the day after we were there, they were getting a house cow and calf. Beverly wants me to help her deliver some skill building workshops in the future and I'm happy to do that. After visiting Beverly and Michael, we drove further north to the home of Ann and Don. 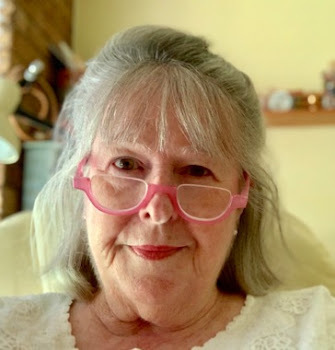 Ann is Calico Ann who reads here and at the forum. I met Ann at one of my book signings during the year. Another beautiful property where we enjoyed a delicious lunch on the verandah overlooking bush land and birds feeding in trays along the fence line. Ann's garden is like ours, on it's last legs, and probably by now has been dug in. She gave us a nice crop of mild spicy peppers and a few chillis to bring home. I already had a bush full of small hot chillis, and I'll be drying many of them for use later in the year, so I made chilli jam using the chillis we brought home, with some from the backyard. 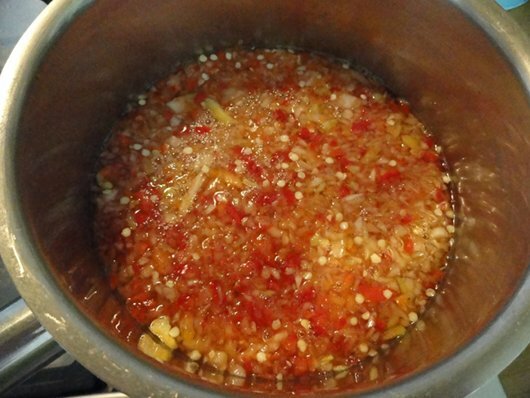 Chilli jam is a delicious condiment to use on cold meat, chicken, avocado, eggs and with cheese. It's hot, spicy and sweet but if you taste it as you go along, you can make it to suit your own taste. 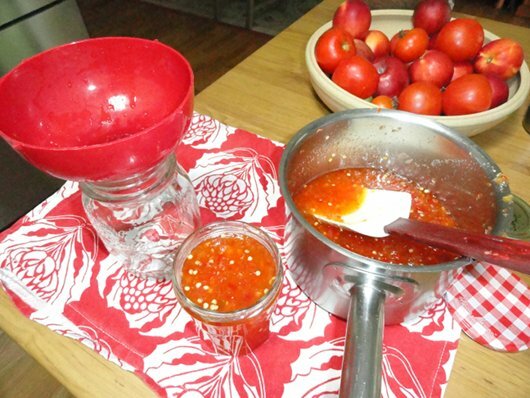 A small jar of chilli jam here costs six or seven dollars so making your own gives you a very nice alternative to mustard or pickles, while keeping your hard-erned money in your purse. Please note: the hotness of your chilli jam will depend on the type of chillis or peppers you use. 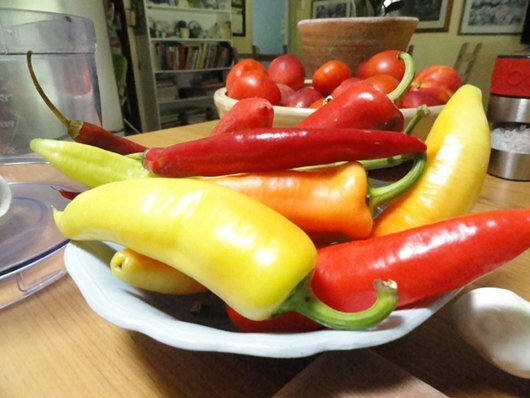 I used a combination of the medium sized, low heat peppers Ann gave me, with six, small, hot chillis from our bush and one large red capsicum/pepper. The heat will also depend on the amount of seeds and membranes you use from the chillies. Taste as you go. If it's too hot for you, add another red capsicum/pepper, if it's not hot enough, add more seeds or more small chillies. 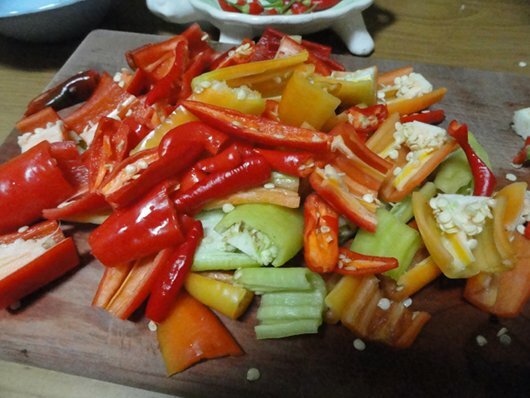 INGREDIENTS - the mix of chillies below gives a hot result. 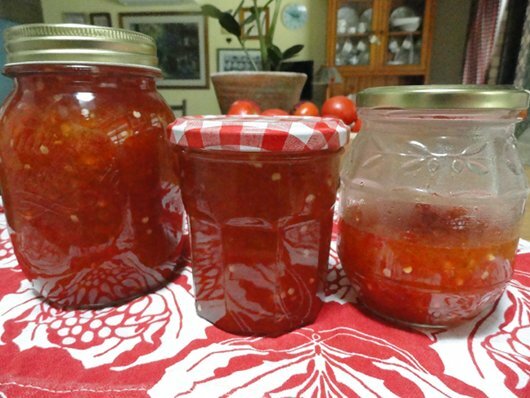 For a milder chilli jam, use fewer hot chillies. Wash the chillies, remove the top stem and chop roughly, leaving in the seeds. Removing the seeds and the inside membranes of the hotter chillies will reduce the hotness of the jam. 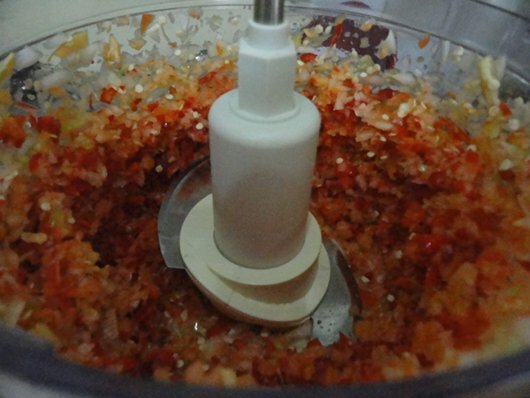 Place the chopped chillies, onions, and garlic in a food processor and blitz until the chillies are in tiny pieces. Place the contents of the food processor into a saucepan and add the sugar and all the liquid ingredients. Stir until the sugar is dissolved and bring the jam to the boil. Take out a spoon full at this point to taste and adjust as needed. Let the jam cook on a rolling boil for 45 minutes. A rolling boil is when the jam boils and even when you put a spoon in to stir it, it continues boiling, but doesn't boil over. 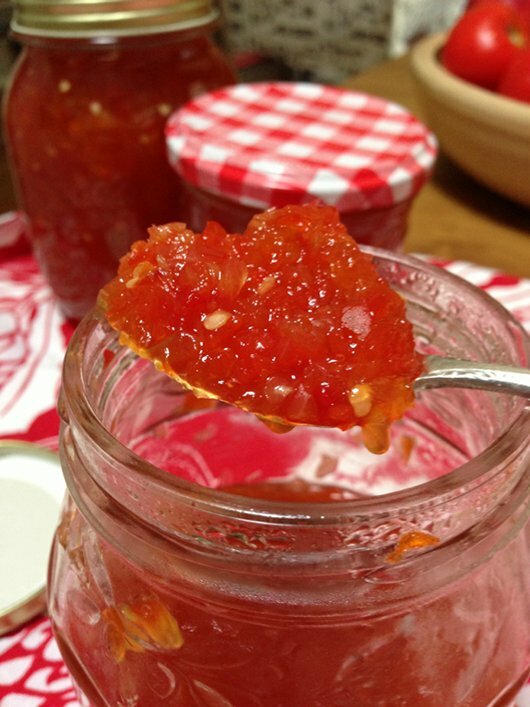 When the jam is cooked and the right consistency (above), pour it into pre-sterilised jars. Put the lids on straight away and secure. Leave out on the kitchen bench overnight and when they're completely cool, store them in the fridge or the cupboard. There is enough vinegar and sugar in this jam to preserve it, you don't have to water bath it as well. If you don't eat it before, or give it as Christmas gifts, this jam will last for about six months. It is a worthwhile use of your time and effort to learn how to make the range of jams, marmalades, sauces, preserves, relishes and pickles that your family enjoys. Those you make will taste better than the bought varieties, trust me, they will, and they'll be healthier and cheaper. It also allows you to use food from your backyard in a number of ways and to store food for use later instead of it being wasted. 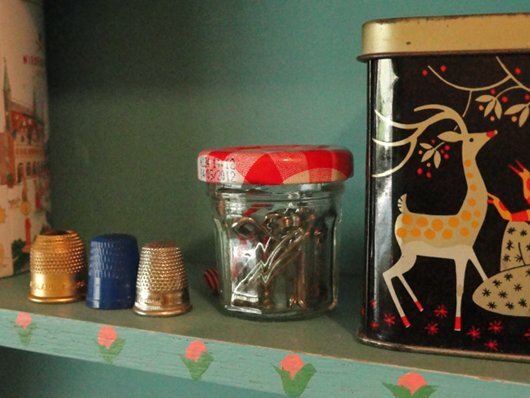 Jam and preserve making is one kitchen skill we should all have. Nothing ever stays the same. Today is the 15th anniversary of the day we moved into our home. While we have made changes almost everyday we've been here, those changes were slow and small and most of them only noticeable when I look back. I didn't realise the importance of many of our changes until they had been completed and then, with the benefit of hindsight, I could see them in context and knew how profound they had been. The one constant of all those changes has been growing older - ageing. I was 49 when we arrived here, 15 years later, I'm about to turn 65. That seems like a really big change to me although 33 to 48 doesn't. My guess is that this change has slowed me down, brought me into a different season and made me a grandma, and that is important to me. I felt that change as it was happening. When I looked into Jamie and Alex's eyes for the first time, I changed. I knew it straight away. I love being a grandma, I even love the name grandma and granny. It's sweet and tender and sounds like what it is. Being a grandma was a familiar change. It's similar to being a parent again, but you don't have the same input and direct, immediate influence you have with your own children. This time around my influence is in being who I am, revealing my character, living to my values and just being there with the love; always with the love. Fiona and Mary sharing a room. One of the changes that comes with age is that your body starts wearing out and things happen that you have no control over. It's nothing drastic yet but when I was younger I used to believe I had control over myself (and a whole lot of other things). Now I know that I just had a body that didn't let me down and get sick. Yesterday I had a bleed into my eye. 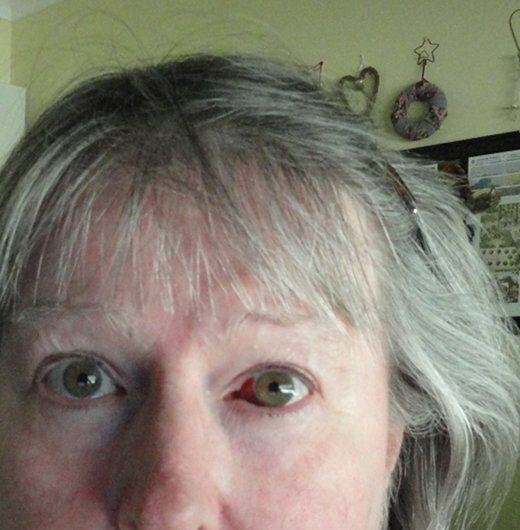 It happened out of the blue filling half my eye with bright red blood. 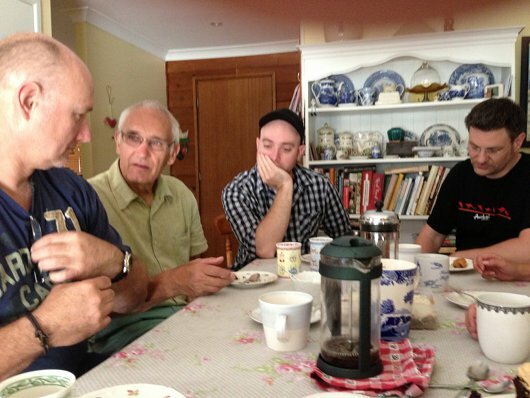 Hanno noticed it when we were having morning tea and sitting opposite each other at the back verandah table. It's nothing to be alarmed about apparently and it will just disappear in a couple of weeks time. I'm pretty healthy, my blood pressure and cholesterol are always normal, I don't take medication for anything but I feel weak when things like that happen to me. I don't like feeling weak. Christmas eye! I've added red to my green eyes. Another change I've noticed, and if you're been reading here for a long time, you may have noticed it too. In the early years here, many readers used to tell me they didn't dare give handmade gifts because they'd be laughed at or insulted. Many said they'd go into debt at Christmas time to pay for gifts that were expected rather than given freely. That has started changing, if the comments on yesterday's post are any gauge. I'm absolutely sure there are many who still do stretch their credit cards over Christmas, but there are fewer, it seems. That is a good thing - another change that happens gradually and that you only really notice when looking back. I was outside gathering herbs yesterday and noticed that our strawberries are still producing small fruit. We'll won't eat them, but the birds will. Over the months, those strawberries have changed. They're not the same as those we grew in winter - sweet, succulent and delicious. I ate many of them straight from the plant then, gobbled down while the birds looked on in horror. Now, the strawberries are small and mean and hold no interest for me. They've changed too much. And that's the lesson for today, for me at least, that every season has its highs and lows. It might be sweet, juicy, organic strawberries or a bleed into the eye. It's all there, the good and the bad, as we travel through the years. The trick is to accept it all with grace and to live like there are fewer tomorrows. For those of us who celebrate Christmas it's only a few weeks away. In fact, Christmas eve is only four Mondays away. Over at the forum, the moderators and I have been thinking about this and have come up with lots of handy hints to prepare for a simple Christmas. Of course, many of us have been working on our Christmas gifts for a while but there are so many things to think of at Christmas time, it's always wise to organise yourself in advance so things go as smoothly as possible. In Australia, it's the time for the major school holiday of the year. Final year students have already done their exams and left school, the others will start going on their seven to eight week holiday in the next couple of weeks. So Australian families not only have Christmas, they also have to organise the younger children while they're at home. It's a very busy time. 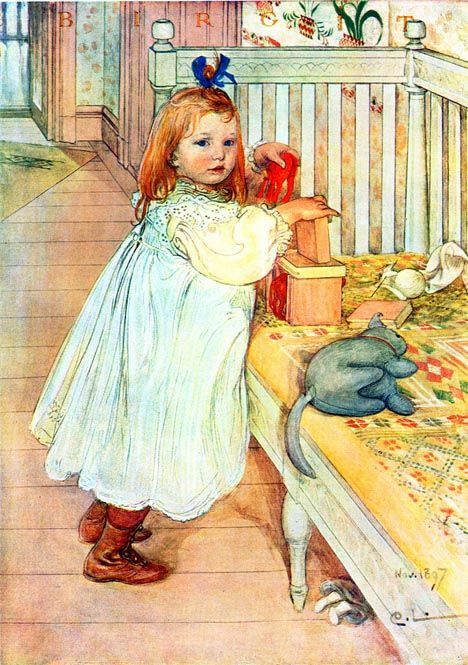 Carl Larsson artwork from here. There will be new Christmas-related suggestions and ideas in all those categories which just about cover every home and backyard. We're not suggesting you rush out and buy, we're suggesting a more mindful Christmas. If you want support for not buying into the Christmas hype, that's there too. There will be ideas for how to best pay off Christmas credit card debt and a couple of handy ways to prevent using credit cards next year. We'll be discussing Christmas decorations, menus, special festive foods, preparing for holiday visitors, hand made gifts, traditions, how to prepare the garden for the holidays, and of course, eating leftovers, cleaning up and much more. We've already been soaking fruit and baking traditional Christmas cakes but it's not too late. If you want to join in, here is the thread. Christmas time can be a minefield of wanting to keep saving for your future and feeling guilty about not buying uncle Bob a fancy tie. These holiday periods happen every year so it's a good idea to learn ways to cope with the guilt and pressure. The forum encourages conversations where you can talk with like-minded people about the problems we all face during periods of machine-gun advertising, how to keep a level head and stay true to your values. It can be done. We'll have a series of forum-related Christmas posts for the next four Mondays, it will end on Christmas eve. Brought to you by the combined efforts of Rhonda, Sue, Rose, Lisa, Lynn, Becci, Sherri, Allison, Amy, Meghan, Narelle, Tania, Sandra, Corrine, Tessa and Robyn. We'll see you over at the Down to Earth Forum. The Christmas-related posts will be going up in the next few hours as the mods come online. 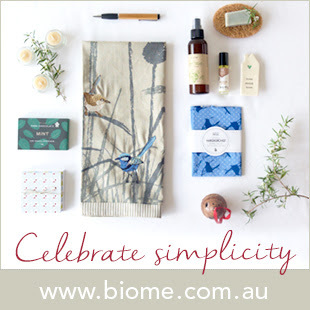 Will your Christmas be simpler this year? Care for an adventure? This couple have just bought their new home. It's old, run down and needs a lot of renovation and TLC. They bought the old post office and school house in the Lockyer Valley, just outside of Brisbane. That where my dad's family is from so I might recognise a few places they'll blog about. Finance was approved two days ago, so now they're just about to move. Let's follow their journey. Another week has faded into history and we're getting closer to Christmas. I'll have to start making some plans. I hope you have a beautiful weekend. Thank you for visiting me this week. See you soon! 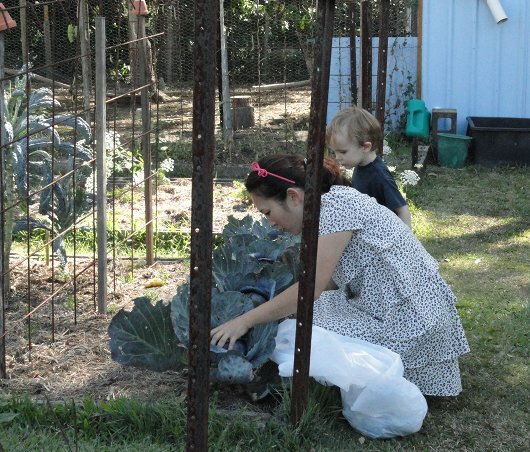 One of the difficult parts of gardening for those new to it is when to harvest. When Reuben and Katie were here last week, Reuben told me that the section in my book about harvesting was really helpful. But it's not only vegetables that need to be harvested, it's herbs too. You don't want to waste anything, so keep an eye on your herbs and when they're growing abundantly, clip them off and dry them for storage so you don't waste any. Always try to cut your herbs just above the nodes because that is where the new growth will come from when the herb starts growing again. Everyone dries herbs their own way, this is what works for me. I always water my herbs the day before I cut them, then cut them first thing in the morning before the sun hits them. 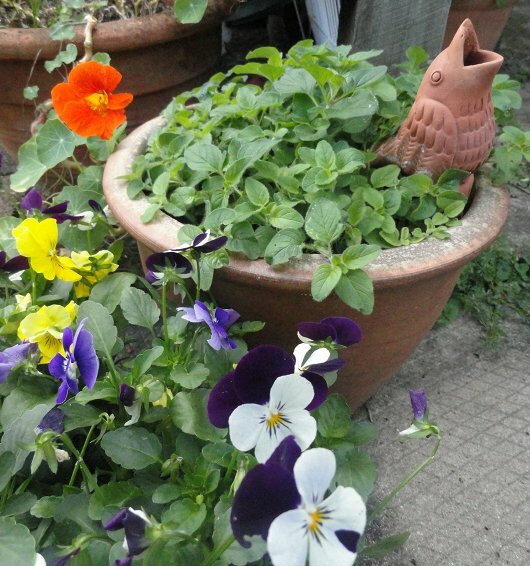 After cutting off what I want, I give the herbs in the pot or in the ground a drink of weak fertiliser tea - something like comfrey tea or manure tea. Don't let it be too strong though, like most vegetables, most herbs should not grow too fast because they need time to develop flavour. We can grow most herbs all year round here but there are times when, if I don't go into the garden for a couple of days, a sneaky grasshopper will have moved in and the mint disappears. 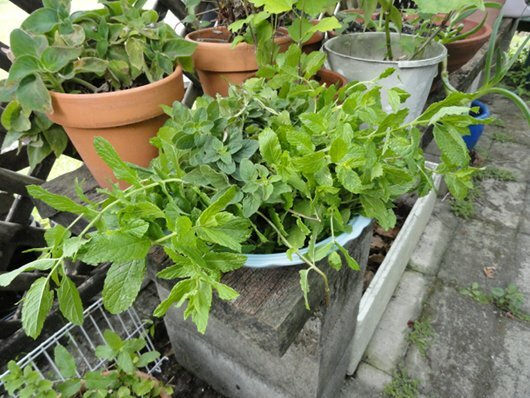 We all know that mint is the easiest of herbs to grow, but when you're waiting for leaves for mint sauce or drinks, you need mint NOW. You can dry many herbs by hanging them in a dry and airy place out of sunlight (below). Or you can do what I do and just place them on a piece of towelling and put them in a slow oven. If you only have a small amount, I lay them on towelling on a plate on the kitchen bench and let them dry there (above). I move them around a couple of times a day (with dry hands) and generally they will dry out well in a week using this method. 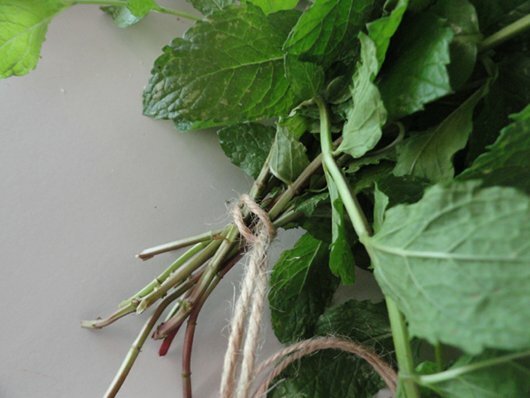 Use a slip knot to tie your herbs. It's the same one you use for knitting. If you use the hang and dry method, make sure you strip off all the leaves near the point where you'll hang them. 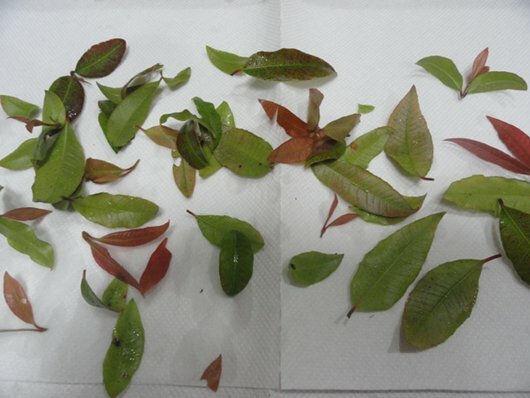 Having leaves there might cause the bunch to go moldy, and stripped stems will help prevent that. Don't throw out the leaves you strip off. Make use of them. I made mint sauce with the stripped off mint leaves I had today. 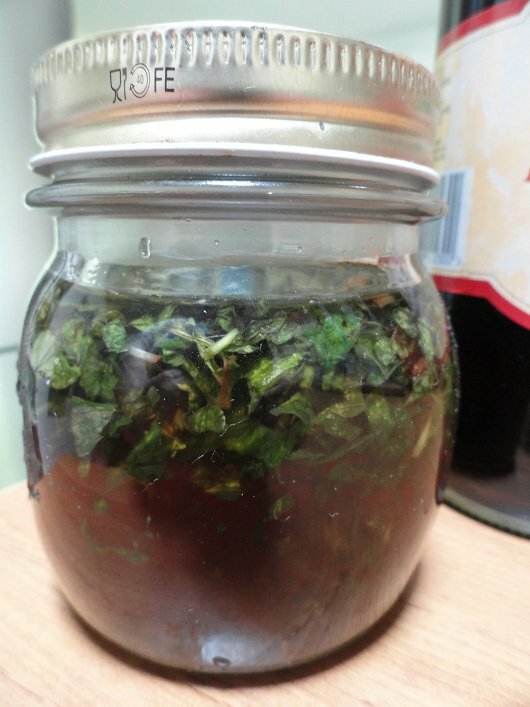 Wash mint leaves and pat dry. Boil small amount of water. Add half cup of water to a jug. 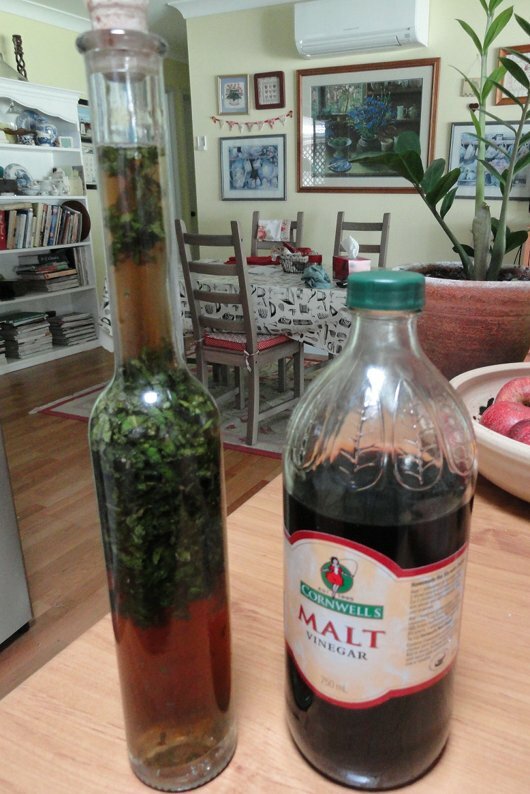 Add two tablespoons good vinegar, I always use malt vinegar because that's what my mother used. Add mint leaves, and stir. You can adjust all the ingredients to suit your own taste. I tend to add a little more vinegar because I like a tart taste. It's delicious on lamb. Wait until this cools and store it in the fridge. It will be fine for at least three months stored in the fridge. Or you can bottle it in a fancy bottle for a gift or store it in a jar for your own use during the next few months. Yesterday I picked a couple of bunches of mint and oregano for storage. 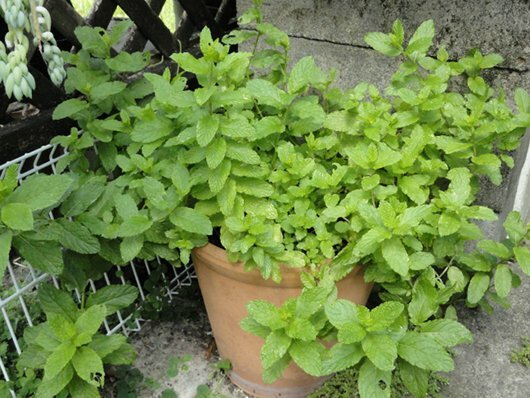 Mint always tastes like mint but oregano changes a little and gets stronger. I like to have some in the pantry cupboard for winter stews and soups and for that to happen, I have to dry it when it's growing well. 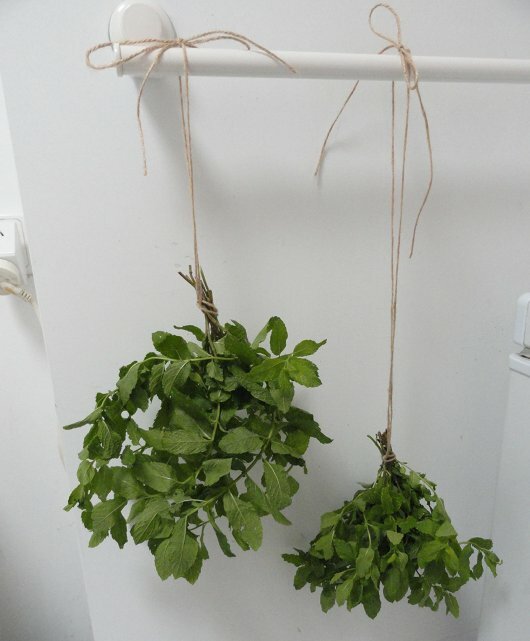 I don't like microwaving herbs, I prefer to let them air dry or to dry them in a low conventional oven. About 110C for an hour will usually dry most herbs out well. Then it's just a matter of checking they're completely dry, crushing them and putting them in a jar with a firm lid for storage. The enemy of dried herbs is moisture so in the first week of storing your dried herbs, check the jars every day to make sure they're not going moldly. If you see any sign of it - like condensation in the jar, place them back in the convention oven on paper towelling and dry them out again. Another good way to store herbs for later use is to freeze them. 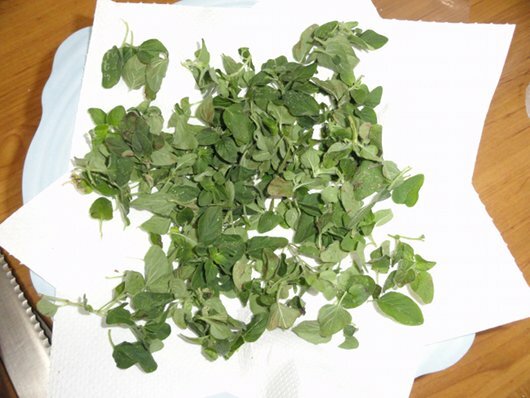 Wash them carefully without bruising them, cut the leaves if you need to, then place some in ice cube trays, Fill up with water and freeze them. When they tray is frozen, pop them out and store in a zip lock bag in the freezer until you need them. 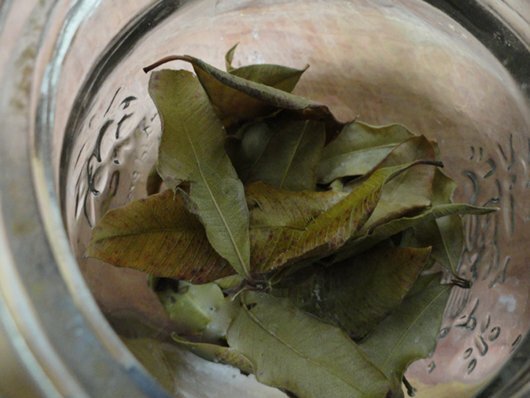 I also have lemon myrtle leaves I'm going to use in my next soap. 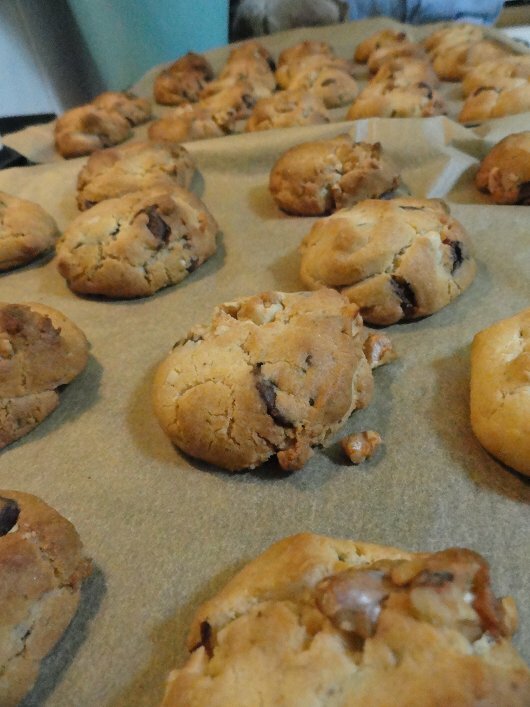 I dried them in the slow oven and they've been sitting in a jar for a couple of weeks. I'll pulverise them with the stick blender just before I use them. My next lot of drying will be the chillies. Chilli bushes grow all year here but they only produce chillies during the hotter months. I'll take advantage of that and dry some every couple of weeks during the growing season. This is an easy task and it saves on paying for herbs and spices during the year, which tend to be quite costly. All it takes is a bit of time and effort and it's one less thing I have to buy at the shops. Are you a leaf dryer too? I have a few photos I've been wanting to show for a little while, so here they all are today. It's not often I can show you 15 recent photos and everyone in the photos is part of my family. 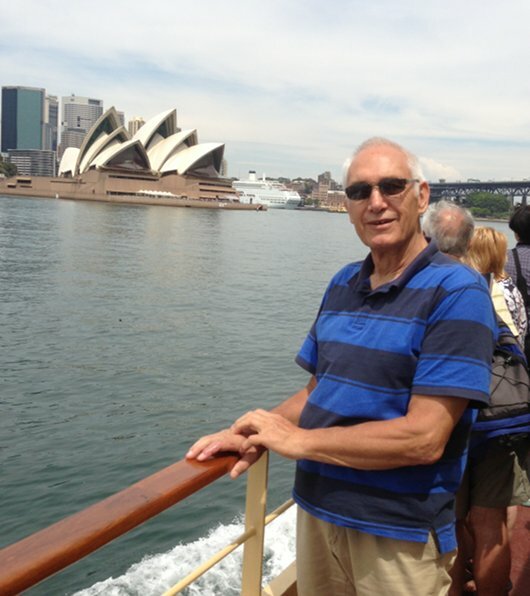 Hanno in Sydney two weeks ago. Martina and Sasha - Martina is my neice, the daughter of Hanno's sister, and Sasha is Martina's cousin. 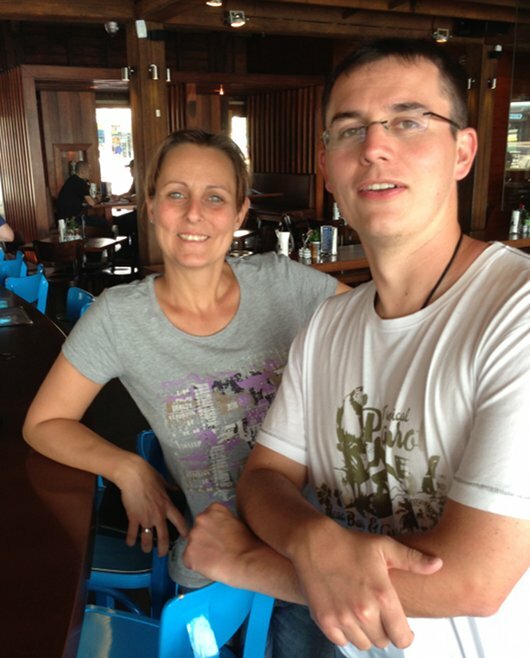 They're visiting from Hamburg, Germany with Martina's husband, Michael, and son Jona. 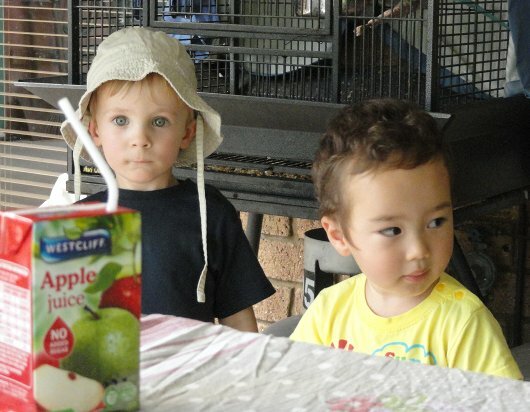 Jona, Martina and Michael's son. 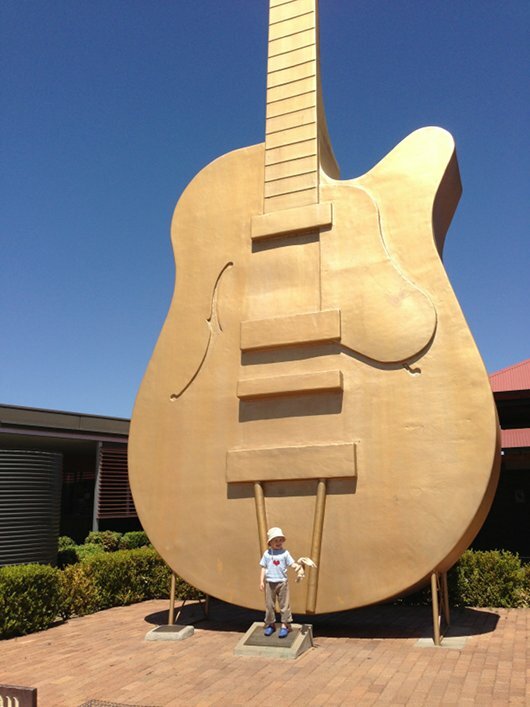 Jona at the Golden Guitar in Tamworth on the way back from Sydney. 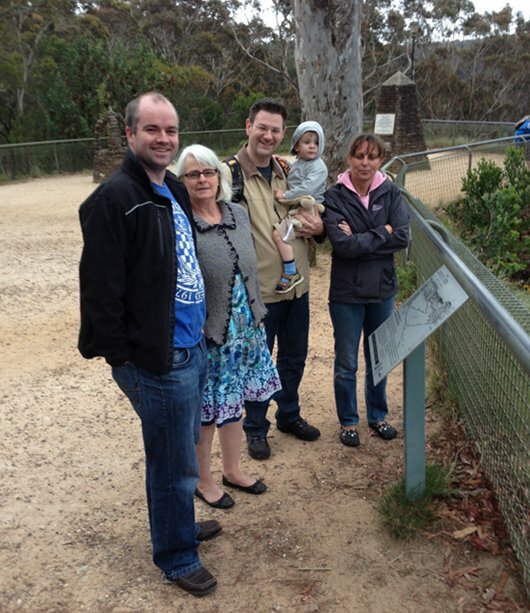 In the Blue Mountains, near Sydney, (from left) my nephew David (Tricia's son), my sister Tricia, Michael holding Jona and Martina. Hanno and Tricia in the mountains. 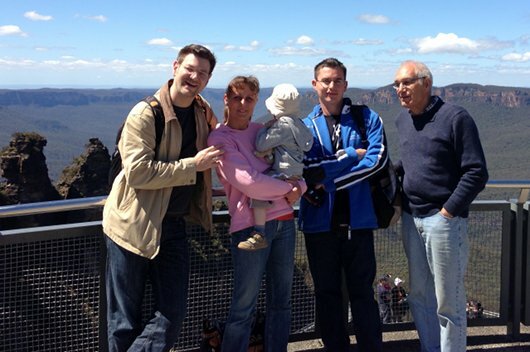 Michael, Martina, Jona, Sasha and Hanno overlooking the Three Sisters at Katoomba in the Blue Mountains. Back home again, Jona with the beautiful Jamie. Everyone starting to sit down for lunch last Thursday. 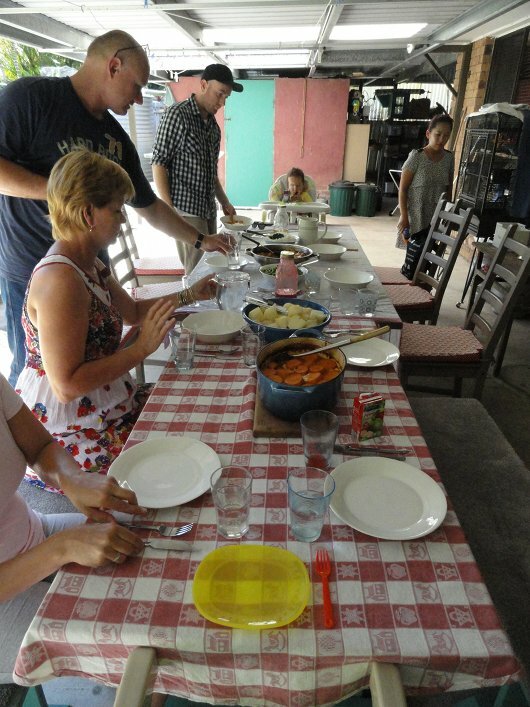 That's Jens my step-son with DIL Cathy his wife, my son Kerry, his son Jamie at the end of the table and Sunny, my DIL. Lunch was chicken casserole, with vegetables our drinks were water, homemade raspberry cordial and elderflower cordial. Jamie and Jona had juice. After lunch, we all came inside for coffee and cake - chocolate and coffee cake. I love this photo - my son Kerry with his son Jamie. 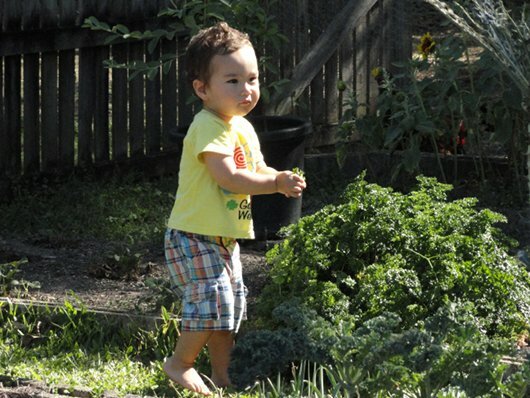 My grandson Jamie helping to pick parsley. Jona with Sunny, picking vegetables before travelling back home. 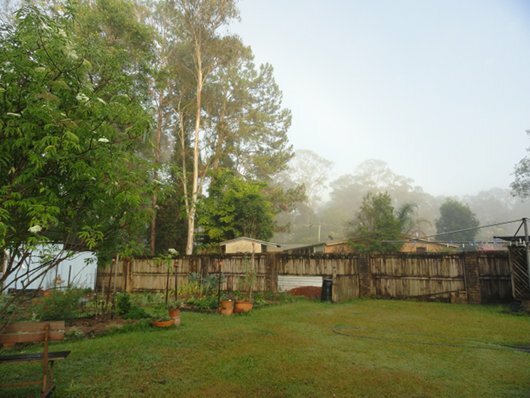 And this is is yesterday's foggy morning when I went out to feed the chooks. It's rare to get fog here so I had to take a photo of it. 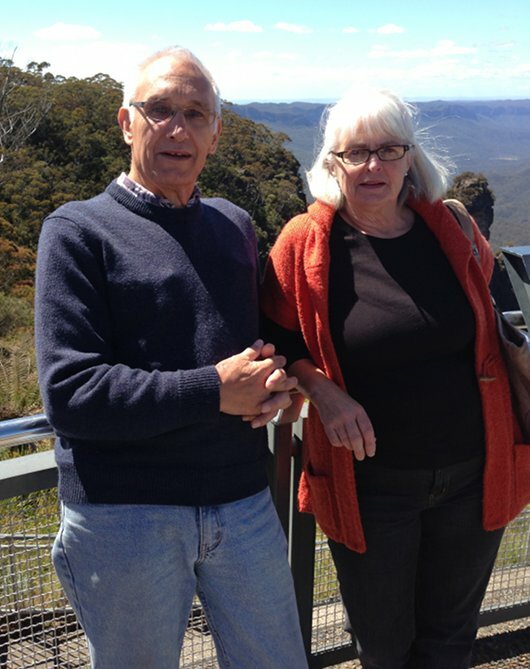 Coralie Allmin, a faithful Down to Earth reader, died after a short illness on 6 November, 2012. 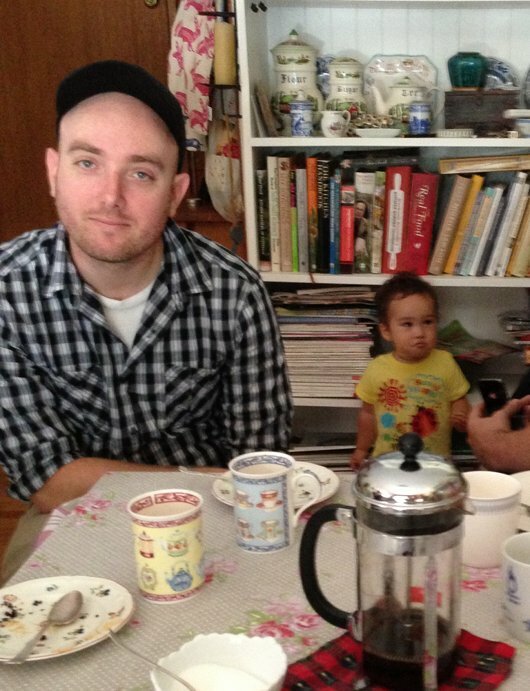 I began questioning the "norm" a few years ago and I haven't looked back. I make as much as I can from scratch now. While I haven't tried your laundry liquid yet I buy a locally made environmentally friendly powder. It costs about the same as the commercial stuff but no nasty ingredients. I will try to make my own soon. Based on my own experience with those older than me (my parents, their friends, relatives) I think you are amazing for choosing to make these changes. I cannot get through to my parents no matter how I approach it. My Mum thinks I'm mad that I don't douse my house in every product on the market and she can't understand why I'd pay an extra $1 per kg for apples from our local organic supplier rather than just buy ones from Coles. However, as much as this irritates me, I also understand it. There are things I would love to try but I'm hesitant on taking the next steps. I would love to learn how to sew past a basic level, knit and crochet but sometimes I feel like I'm almost too old now to learn to do these so I can get to a point where I'm making clothes, knitting booties and jumpers etc. I anticipate it will take me years and years to get past a basic level. As it is, I just can't see I will be able to even start to learn within the next two years simply because of the ages of my two children. I don't have the energy in the evenings and being home full time with them the focus I need just isn't there. That may sound like an excuse however I know within myself it is genuine, I have gone to huge effort the past year to change the way we live and we have made huge progress. 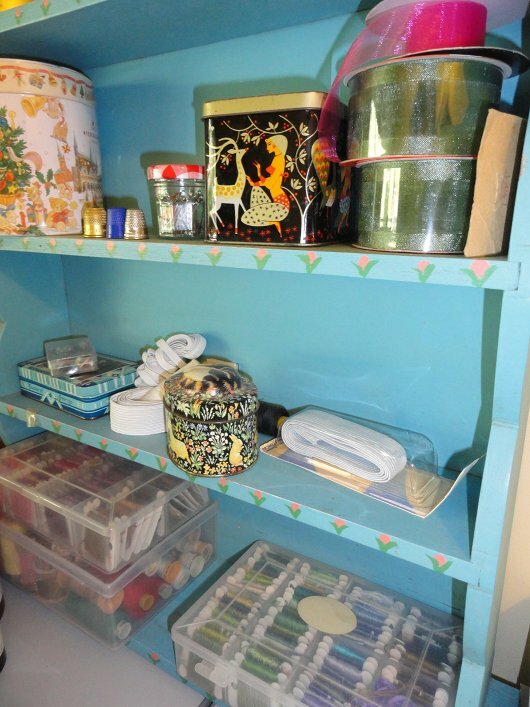 Did you find making these changes daunting? 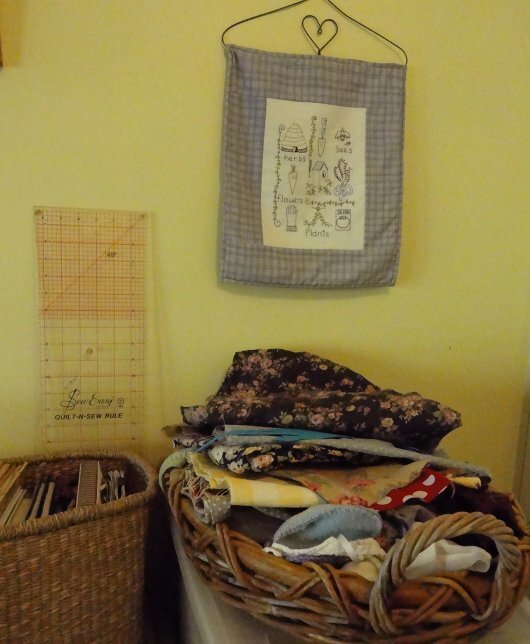 Did you ever feel that it wasn't "worth your while" to learn to make your own clothes and it would just be easier to op-shop? I'm not sure if I'm explaining myself well...hopefully you understand what I mean! Hello Sara. I understand it too. Most people do what is familiar and comfortable. My guess is that the older people you know have not yet found a good reason to change. I know, from personal experience, that no amount of talking will convince anyone to change along with you. It's like teaching children - you can tell them to be respectful or courageous or gentle until the cows come home but they are much more likely to do it if they see you do it. Role models are such a powerful force. If you want your parents to change, stop telling them what to do and just get on with your simple life. If they see the difference it makes in your life, and that you are happy, they're much more likely to try a few small changes themselves. Yes, I found some changes daunting, I still do; I will keep changing. But I also realised that while some changes simply slip into our lives easily, others require their own time. I'm much more patient and I know now that this life is a series of never ending small steps. The changes I've completed so far have taken ten years. I haven't regretted learning anything and although I didn't use all my new skills straight away, there always came a time when I needed what I had learned. Many things must wait while you raise your children - that is your main focus for now, and should be. As they grow, the amount of time you have and your energy level will increase. So don't worry about not doing everything you want to do, that time will come. It's not necessary to do it all at once. So instead of pushing yourself to grow vegetables in the backyard, find a good local market to buy your fresh fruit and vegies. 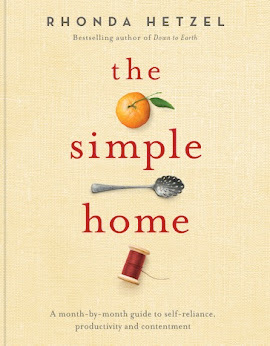 Use simple living tactics for the things you're doing in your daily life instead of opting for convenience - use a menu plan, stockpile, stick to your budget, pay off debt and be a good role model. The time will come later on for soap making, compost and vegetable gardens. I would encourage you to learn to knit at this time. 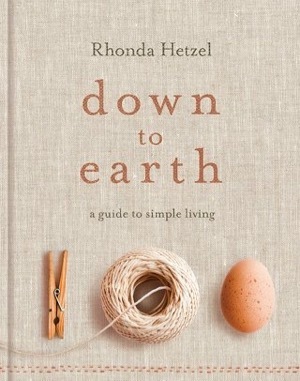 Unlike sewing, knitting is a small thing - you don't need a large space to cut out fabric, you don't need a sewing machine. Knitting is just you, two needles and some yarn. Also, if you make a mistake while knitting, you can just unravel it and start that row again. It's portable, so you can take it with you when you take the children out, or you can do a few rows while you sit with them as they play. Start with dishcloths/facecloths. They are just a knitted square but they're an excellent way of replacing Chux and sponges, and all those squares will help you practise your knitting skills. 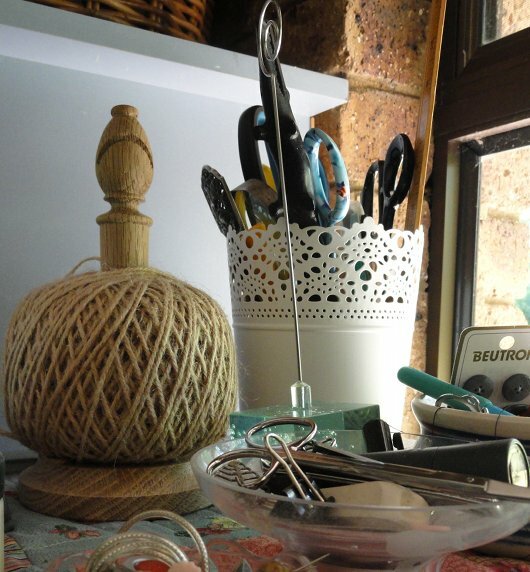 You can buy knitting needles and, sometimes, yarn or old woollen jumpers to unravel at the op shop. 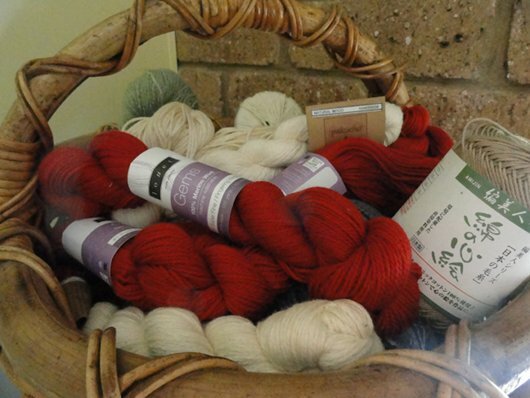 For dishcloths you'll need 100 percent pure cotton and you can get that from Bendigo Mills (a 200 gram ball is four normal sized balls) and sometimes on special at Spotlight. It doesn't really matter what size needles you use on dishcloths. 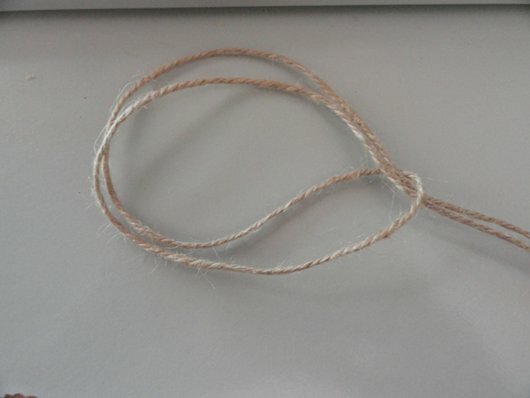 There are excellent instructions on how to start knitting on Youtube. There is not a set in cement way of living simply. We all do it in the way it suits us and that will change all the time, depending on your season of life and the circumstances you find yourself in. A good example of this was when Hanno had his recent accident. We use my homemade soap in the shower and to wash our hands. 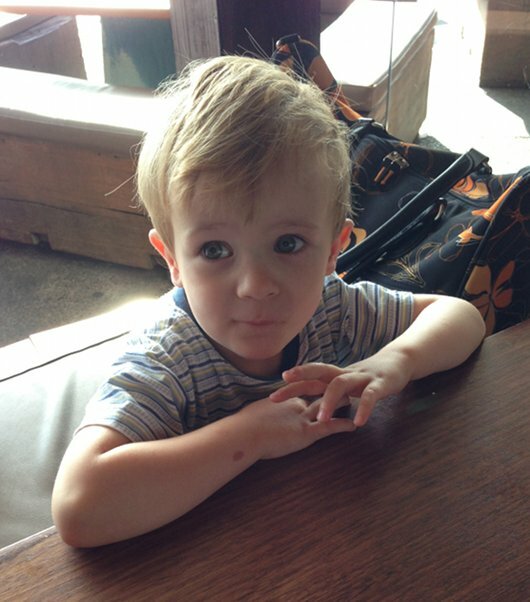 When Hanno was able to use only one hand, it was easier for him to use liquid hand wash and body wash in the shower. I had absolutely no problem using those products because it made it easier for him. Now things are almost back to normal, as soon as the containers are empty, we'll go back to soap. I feel no guilt for making that change and if I had to do it again, I would. If it were going to be a permanent thing, I'd make liquid soap. Forget the idea you have of the perfect way to live and just do the best you can do each day. Some days that will be 10 out of 10, some days it will be 1 out of 10. As long as the 1 out of 10 is the best you can manage on that day, then you're still living true to your values. I will not walk in and ask you to account, there are no simple living police to tell you you're not doing it right. Do the best you can every day and let that be enough. Home grown vege protein - enter the Madagascar bean. I grew these for a few years and as one of my sons would say, "they're epic". How to devise passwords that drive hackers away - this is for mamma-lana and anyone else with an easy, short password. I'm wondering how you all deal with spam on your blogs. I have tried to simplify the comments process here by taking off word verification. Over the months since I did that, I've had thousands of spam comments. I deleted almost a 1000 spam comments last week (a couple of days worth) and then waited to see how many more came in. In 14 minutes I got 54 spam comments. I then put word verification back on again and have had two since. So word verification has to stay even though I know it makes it difficult if you're commenting from an iPad or phone. Bloggers ability to pick up spam and put it straight into the spam folder is excellent, but there's so much of it, just getting rid of it every few days takes time because I can only delete 100 at a time. There is also a problem some readers have reported about comments disappearing. Does that happen on your blog too? Do you know why? I've written to Google about this but haven't had a reply. I doubt I'll get one now. If you're a new reader here, it is much easier to comment if you have a Google ID. It's the same one you get if you sign up for any of the Google accounts - gmail, Reader, Feedburner etc., or you can use your ID from Wordpress, Livejournal, Typepad, Aim, your name and url or as anonymous. You just make your selection from the comments section. Once you choose an ID, it remembers it, so you'll probably only have to do that once. I was going to stop the anonymous comments too because when I get hate-filled comments, they're always anonymous. Funny that. You would think that if you felt so strongly about something that you'd step up and own your comments, but there are a lot of cowards hiding on the internet. However, I know some people who comment can only comment as anonymous so I'm leaving that on. I'm not sure why that is but a few readers have told me that is their experience. I am so grateful for comment moderation. Do you use it? I know very many of my regular readers by name but those who are new to me with a name I don't recognise, I am now checking them out before I publish their comment. Reinstating the word verification has stopped hundreds of spam comments but some human spammers are now creating a ID, then they make a comment that is related to the post so it looks genuine. I've just realised though that many of these are fake and have a link to a business or website that none of us want to see, or even know about. So I've been going through the old comments and deleting those. If you find one, can you drop me an email with the link to the page please. Thank you. And that's another way spam comes in - emails. They probably don't think of themselves as spammers but I get a lot of emails from advertising agencies and PR firms asking to advertise on my blog. I got one this week inviting me for cocktails at a fashion extravaganza! Do they not read my posts? Anyhow, if you work for one of these places, please take me off your mailing list because I will never reply to your emails. I will only ever recommend products that I use myself, I know fit in to the life we're all trying to live or for some small home businesses through my sponsor buttons. Surely it's not only me who has a big problem with spam. If you do I'd love to know how you deal with it. When I first decided that I'd had enough of my rampant spending and the insidious system that encouraged it, I realised that a lot of the products I bought were advertised under a veil of misinformation. I knew that if I was to go on to develop a better life based on my values, I'd either have to disregard advertising altogether or at the very least, read and understand ingredient lists, examine products carefully and look beyond face value. My path from then on was to think about everything I bought, particularly the ordinary and mundane things that fill up our fridge and pantry as well as clothing, shoes, makeup, appliances and most of the other "must haves" that make up modern life. Over the course of about a year, I cut many things from our grocery list by asking myself this simple questions: What is the truth of this? 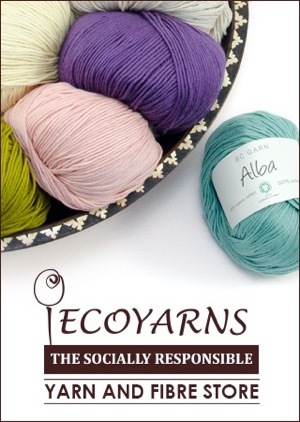 I realised that for many of our common items, I could make them better, healthier, cheaper and in a way that didn't impact on the already overstretched planet. 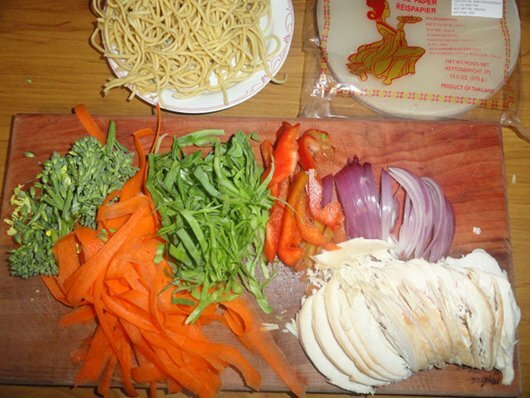 Making spring rolls at home. Beetroot grown in the backyard for baking and pickling. 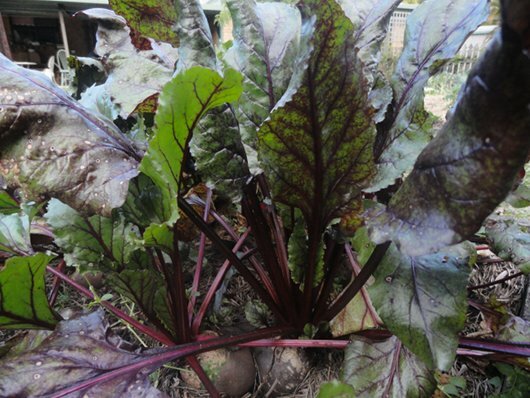 Two small crops of beetroot will see us through our warm months when we have it pickled, with salads. The "What is the truth of this?" question works well on food and groceries. The truth is that generally these products have been based on a simple recipe and then various preservatives, colourings and flavour enhancers are added because nothing tastes as good as home made and these commercial products have to sit on a shelf until someone buys them. I used to be one of those buyers but not now; now I make everything I can. If you're not making you're own laundry and cleaning products at home, you're paying too much. Forget about your favourite brands and cut down on the number of chemicals you have in your home. Cleaning and laundry products are the shining stars of what can be done better and cheaper at home. You don't need wood cleaner, bench cleaner, wall cleaner, glass cleaner, floor cleaner, bath cleaner, or any of the one-job products stinking up the cleaning aisles of most supermarkets. Most things can be cleaned effectively using vinegar, soap, bicarb, citric acid or just water and a stiff brush, or a recycled, soft, cotton cloth. You can make your own soap. The soap I make has four ingredients - caustic soda, olive oil, coconut oil and rain water. Regular bar soap contains a list like this: Tallow (this is animal fat), water, sodium cocoate, glycerine, fragrance, sodium chloride, titanium dioxide, ethidronic acid, tetrasodium edta, CI73915, CI74160. Your skin is your body's largest organ, you should trust what you wash yourself and your clothes with. The story's the same with laundry products. They can be easily made MUCH more cheaply than commercial products and they work really well. 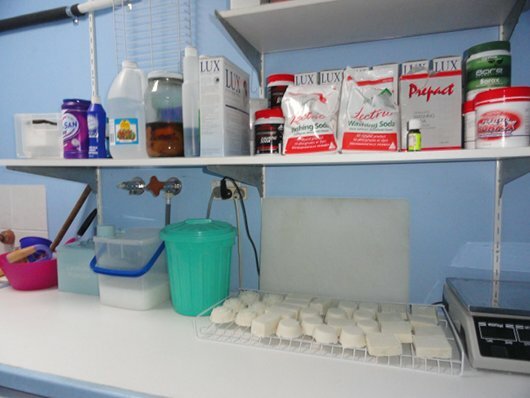 I make laundry liquid using four ingredients - soap, borax, washing soda and water. Have a look on the packet of commercial liquid and you'll find the story is completely different. And it doesn't have to be. The recipe for making laundry liquid using four ingredients is in my side bar. 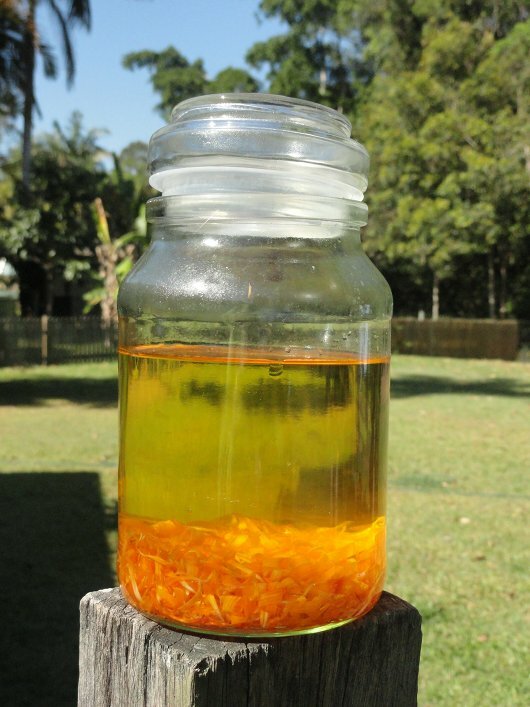 Calendula oil, made by infusing calendula petals in olive oil and just sitting the jar in the sun for a week or so. This can be used for itchy and inflamed skin, nappy rash, eczema, stings and bruises and also as a base for lip balm and ointment. If you make your own soap, you can also use it to make a soothing soap. When it came to products not purchased as frequently, I still asked that question. "What is the truth of this?" The answer could be anything. It could be, in the case of clothing or shoes, that it was made in a sweat shop. In the case of makeup, it could contain harmful ingredients or that the ingredients hadn't even been tested for safety. For appliances, the answer may be that it was made to break and be unusable in a short amount of time - generally just outside the time the warranty expired. So I started teaching myself to make clothes and while I'm not making everything, I do make some things and I'm happy that I do. I can't make shoes but I'm still wearing the shoes I wore when I was working for a living. I have certainly stopped wanting new outfits and matching shoes every year. I never look fashionable but at least my clothes are clean and tidy. 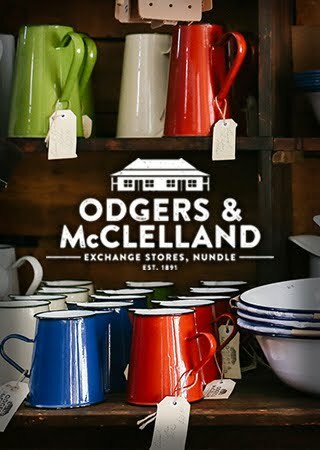 And when I'm shopping for appliances, I look for those that can be fixed, have a low need for electricity and, hopefully, made in Australia; although that is now becoming a rare find indeed. Cheap and easy biscuits - recipe is here and to make the condensed milk you need in the recipe, that is here. There are some good products out there but you have to know what they are and if they suit you and your budget. Do your research. Don't buy something because you always do, be mindful of your family's health when you shop and if the price is an issue, see if you can make that product at home. Most food and cleaning products can be made at home, just like our great-grandmothers and all her antecedents did. Most of the products we use regularly arrived in our supermarkets in the 1950s and 60s. It wasn't always like this. We've been spun a line, a line that contains mostly a commercial core and I've stopped believing that our products have been tested and are safe. I no longer believe that our government protects us. They're more concerned with keeping big business profitable. I want all our countries to continue to prosper but not at our expense. So at every opportunity and small step by small step, I look at something I need and continue to ask the question. What is the truth of this? Are you a mindful shopper? Do you check ingredients lists and country of origin?